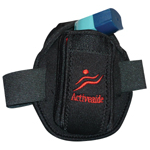 The Asthma Inhaler Sports pouch is very versatile and can be worn comfortably for sporting activities or at any time! 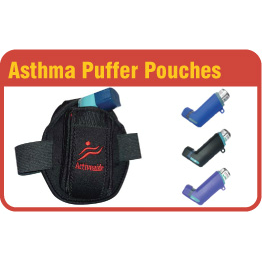 The Asthma Inhaler case/pouch is very versatile. It’s comfortable to wear while doing sporting activities or at any time and can be worn as either an arm or leg band. You can attach it to a waist belt if you wish. Made of neoprene with a safe overlap closure. It has a very easy grip elasticised Velcro strap. Comes with both adult and youth arm/leg strap. Good fit with a choice of bands – aimed at youth fit or adultvfit, but I like it so I can wear it on my ankle or arm. Quite basic – can’t carry anything else with the inhaler. Just what i needed to carry my inhaler. I’ve just done tough mudder and it went through water, mud and numerous obstacles and didn’t shift off my arm. Really comfortable! Excellent fit and perfect size. Exactly what my daughter needed to run with.